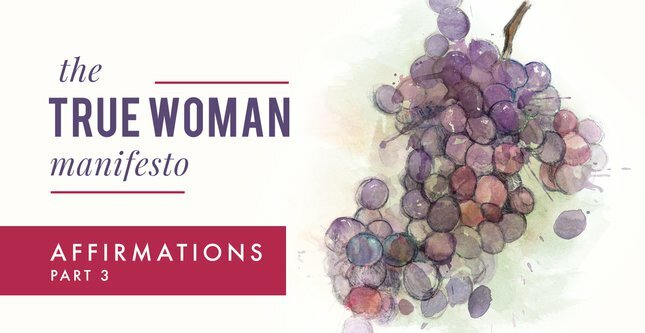 Download the True Woman Manifesto. Leslie Basham: Nancy DeMoss Wolgemuth says something basic, yet profound: People are extremely valuable. Nancy DeMoss Wolgemuth: Listen, you may love your pet, but I’m telling you, your pet is nothing compared to you. God has a unique affection for human beings—for men, for women, for His creation—that is different than the way He thinks or feels about any other created thing. Leslie: This is Revive Our Hearts with Nancy DeMoss Wolgemuth, author of Surrender: The Heart God Controls, for Monday, May 28, 2018. Human life is extremely valuable. Why? Nancy DeMoss Wolgemuth is about to share with us the biblical basis for the sanctity of human life. She’s teaching through the True Woman Manifesto in several series this year. As we come to this statement in the Manifesto about the value of life, we are going to begin with a poetic sermon written in 1927 by James Weldon Johnson. Singer Wintley Phipps recites part of the poem. Well, we’ve just heard a creative rendering of one of the most poignant and important scenes in the whole Bible. The scene, the Creation, is the foundation. It’s the starting place for next affirmation in True Woman Manifesto. Let me read that affirmation, and then we want to spend a couple of days breaking this one apart and pondering its meaning. Here’s what it says. We affirm that human life is precious to God and is to be val­ued and protected, from the point of conception until rightful death. Now, the sanctity of human life . . . If you’ve been around any length of time at all, you know that this is a great divide in our country on this issue. You hear a lot of rhetoric, a lot of intense emotions, a lot of finger-pointing around this point. It’s easy for us who consider ourselves to be pro-life to lob grenades at those who disagree with us. I want to take some time to examine this matter from a biblical perspective and maybe some ways that we haven’t quite thought of it before. In today’s program we want to look at: Why is human life so precious to God? Then tomorrow I want to talk about this culture of death that is so pervasive in our society. I want to suggest something that you may not have considered before, and that is, that many of us who call ourselves pro-life may actually be promoting a culture of death. So I want to talk tomorrow and how can we promote a culture of life. But the starting place for this affirmation is just that short sentence: “Human life is precious to God.” I want to give you five words today to wrap our thinking around—five words to describe why God values human life, why it is so precious to Him, and how human life is different from other life forms. Here are the five words: creation, reflection, affection, redemption, intention. These inform how we view life, human life, and how we treat it. So let’s pick up with the first one, creation. Creation – human life is precious and is to be valued and protected because it is God’s special creation. You see, when God created trees and plants and animals and fish and birds, He merely spoke them into existence. But when God made human life, He so to speak, and I don’t mean to be disrespectful, rolled up His sleeves and got His hands involved. He personally shaped and made and formed human life in a way that is different from the rest of creation. Genesis chapter 2 describes this process for us. I know it is a familiar passage, but sometimes we just have to go back to these passages and read them or hear them with new eyes, new ears, as if we were reading them for the first time. Then the LORD God formed the man of dust from the ground and breathed into his nostrils the breath of life, and the man became a living creature (v. 7). God shaped the man; He formed the man. He breathed into him, and the man became a living soul. The LORD God caused a deep sleep to fall upon the man, and while he slept took one of his ribs and closed up its place with flesh. And the rib that the LORD God had taken from the man he made [He fashioned, the literal word is He built] into a woman (2:21–22). It’s a very personal, involved, engaged act of creation when it comes to the man and the woman. You see throughout Scripture this emphasis on a personal God creating human beings. Is not he your father, who created you, who made you and established you? (Deut. 32:6b). The LORD who made you, who formed you from the womb and will help you (Isa. 44:2a). A personal God engaged in creating and loving and fathering and helping His creation—human beings. It’s not surprising in light of all this that there is such a battlefront on this whole issue of creation and evolution. That whole issue is not insignificant. If we believe that humans evolved from lower forms of life, then life is ultimately meaningless—human life is meaningless. And what we end up with is this survival of the fittest, this utilitarian view of life where the value of a creature depends on how healthy it is, how productive it is, how useful it is, what it can produce, how well it can function. This was the fundamental view of Nazism – those who were considered less useful by the State ended up in concentration camps or gas chambers. Even in our society today we see this move where it is considered that those who are unable to function on their own or are considered unnecessary or a drain on the state or their families or society, you have more and more people who say those people have no right to live. Society, family, friends, have a right (or even obligation) to end their lives. What we end up with is a national culture of death. Moses said to the LORD, 'Oh, my Lord, I am not eloquent [I’m not a speaker], either in the past or since you have spoken to your servant, but I am slow of speech and of tongue.' [I stutter. There is no way I can go speak to Pharaoh and tell him, 'Let my people go.'] Then the LORD said to him, 'Who has made man’s mouth? Who makes him mute, or deaf, or seeing, or blind? Is it not I, the LORD?' (Ex. 4:10–11). God is the sovereign Author and Designer of life. That’s why He alone has the right to give and take life. But God has an enemy. Satan hates God, and he hates human beings who are made in the image of God. From the beginning of the human race, Satan has tried to devalue and destroy life, and in so doing, attack God. Satan was behind the very first murder. First John tells us that Cain, Adam and Eve’s son was “of the evil one and murdered his brother (1 John 3:12). This was motivated by Satan himself. So Satan tries to steal life, to take it, because he hates God. But if we look at it from God’s perspective, God is the creator, and man and woman are God’s special creation. That’s why human life is precious. It’s to be valued, and it is to be protected. The second word is Reflection. Man was created to reflect the image of God. You are familiar with the passage in Genesis chapter 1, verse 26. Then God said, 'Let us make man in our image, after our likeness.' [This is the Trinity holding a council in heaven. They say to each other, let us make man in our image.] So God created man in his own image, in the image of God he created him; male and female he created them. And God blessed them (Gen. 1:26–28). Unlike ladybugs and daffodils and geese and turtles—cute as we may think all these things are—man and woman, unlike all the rest of life are created in the image of God, in the likeness of God, to reflect the glory of God. Human dignity and value and worth is not based on what we can produce, or our achievements, or our IQ, or our abilities, or our earning power, or our physical abilities or disability, or how we measure up to others. Our dignity, worth, and value is based on the fact that we were created in the image of God. By the way, that includes you—flawed and failing that you may see yourself to be. You were created to reflect the image of God. To devalue or harm human life is to devalue God. It’s to attempt to harm God Himself. God takes it personally when we devalue human life. We are the apple of His eye. When we attack human life, we attack God. Creation, reflection, and then affection. When I look at your heavens, the work of your fingers, the moon and the stars, which you have set in place, [The implication is, those things are awesome, they are amazing, they are mind-boggling, but] what is man that you are mindful of him, and the son of man that you care for him? Yet you have made him a little lower than the heavenly beings and crowned him with glory and honor. You have given him dominion over the works of your hands; you have put all things under his feet, all sheep and oxen, and also the beasts of the field, the birds of the heavens, and the fish of the sea (Ps. 8:3–8). Listen, you may love your pet, but I’m telling you, your pet is nothing compared to you. God has a unique affection for human beings—for men and women, for His creation—that is different for how He feels about any other created thing. We have switched the price tags on God’s creation. We devalue human life while elevating other created things. This build that we are in today, our National Ministry Center, is sitting on a beautiful piece of property. I remember years ago when we were getting ready to build here. We owned the property and were working on plans for construction, and the EPA found this tiny, little flower called a “prairie trillium” (a small lily) that was growing on the property. That prairie trillium is considered an endangered or threatened species. It’s protected by the state here in Michigan. We had to go through tons of red tape, holding up construction while each of those little flowers was “rescued.” That’s the term they used. They rescued those flowers, each one under the watchful eye of the EPA, somebody who was approved to do this kind of work, had to pick up each one of those plants and them replant them on another site on the property. The EPA cares a lot about those trilliums. They are pretty. Look at the birds of the air: they neither sow nor reap nor gather into barns, and yet your heavenly Father feeds them. [He cares for them. He takes care of them.] Are you not of more value than they? . . . Consider the lilies of the field, how they grow: they neither toil nor spin, yet I tell you, even Solomon in all his glory was not arrayed like one of these. But if God so clothes the grass of the field, which today is alive and tomorrow is thrown into the oven, will he not much more clothe you, O you of little faith? (Matt. 6:26–30). You see God’s priorities, the value He places . . . Yes, He cares for birds. Yes, He cares for flowers. Yes, He robes them so they are beautifully dressed and adorned. But the way He cares about us is unique; it’s distinctive. God has uniquely placed His affection and His attention on human beings. He cares for birds and flower. How much more does He care for us? Throughout gospels you see this tender, caring heart of Christ for people, and not just wealthy people or smart people or people in big positions, VIPs. You see His heart for those who are poor, those who are weak, those who are disenfranchised, those who are needy, those who are oppressed, those who are children, those who don’t rank high—in that culture, women and children didn’t rate very high on the pecking order. But Jesus loved women; He loved children. He cared for them. He care for those who had been rejected, those that nobody else cared for. It’s a reminder that if we want to be true followers of Christ, true women, then we will have the heart of Christ. We will have affection and care and compassion for those who maybe no one else cares for or thinks very much of. Every life precious to God. Every human life distinct from all other living things. So we have creation, reflection, and affection. Human life is precious to God and is to be valued for these reason. And then, for a fourth very important reason, and this is: redemption. Redemption. I won’t say much about that here except that it is just so obvious that Jesus did not come to this earth, leave the splendor of heaven, take on the form of a servant, and come and live for thirty-three years on this planet in order to die for slugs or maple trees or gold finches. He didn’t do it for them. He gave His life; He shed His blood; He died for lost, sinful, fallen human souls. Doesn’t that say something about the value of human life? It’s precious because of redemption. And then number five, human life is precious and is to be valued and protected because of intention. God was intentional in creating human life. He created us for His Kingdom purposes. We were not some random afterthought. “I think we’ll have something different.” God was intentional about creating us. God has a mission, a plan, a purpose for each human life. The plan has been in place from eternity past before we ever were, before we ever were conceived, God knew us. He designed us. We were created in His mind, in His heart in eternity past with a specific plan and purpose for our lives. For we are his workmanship [God forms the man, God made the woman, He shaped, He built, we are His workmanship], created in Christ Jesus for [a purpose] good works, which God prepared beforehand [before He even made us, He planned those works], that we should walk in them (Eph. 2:10). Before I formed you in the womb [before anyone ever thought about you, before there was a cell in your being] I knew you, and before you were born I consecrated you; I appointed you a prophet to the nations (Jer. 1:5). God says, “I have a purpose for you. I have a design for your life.” Now, God’s design for your life may not be to be a prophet to the nations, but it is something. God knows what it is, and it was designed for you before you were even born. [God] set me apart before I was born, and . . . called me by his grace (Gal. 1:15). There are some days when I would like to trade jobs with somebody else. You have the same thoughts. Some days I think I would like to have not so much pressure, have a different life, maybe do something a little different. Then I’m reminded: before I was born, God called me. Before I was shaped in my mother’s womb, He called me by His grace. He designed, He prepared good works for me to walk in them. I have no choice, in a sense, a glad choice I make, but my choice is to say, “Yes, Lord, I surrender to what you have designed for my life. I realize that it is important, it is necessary that I fulfill that which You have created me." God has a purpose for every human life—even those that some would consider useless. That ninety-two-year-old woman in advanced stages of Alzheimer’s, just hanging on with no clue who anyone is or what’s going on. God has a purpose for her life for every day that she is here on this earth. That child with severe disabilities; that baby born with multiple birth defects; that young adult child who is autistic; special needs children; adults who can’t care for themselves. That woman I spoke with a few days ago who is in hospice care dying of cancer. God has a plan for her life—for this moment, for these days, for this season. If God is still granting that person breath and life, then there still is value in that life. That life is still precious, whether that person, that child, that adult can contribute the way that our society feels it should or not. Human life is precious to God for all of these reasons: creation, reflection, affection, redemption, and intention. For all of these reasons, human life is precious to God and is to be val­ued and protected through the whole span of life—from conception to the grave and everything in-between. It’s every human life that we are talking about. That means others’ lives, and it means your life. You may struggle with feelings of worthlessness, as I find so many women do. “The world would be better off if I’m not here.” So many women feel that way. Human life is precious to God. That means yours. There may be more extreme issues that you are dealing with. Issues of: cutting, eating disorders, thoughts of suicide. Can I just remind you that God created you. God created you. You are precious to Him. He created you for a purpose. He ordained every, single day that is planned for you, from your first breath to your final breath. He has a purpose for your life. So don’t despise what God prizes. Leslie: Nancy DeMoss Wolgemuth has been describing the incredible value of life. I’ll just go ahead and tell you that Nancy continues this discussion tomorrow. I think many, many listeners will be convicted by the surprising twist Nancy takes tomorrow. We are addressing this topic now because it’s part of the True Woman Manifesto. I hope you’ll get a copy of the Manifesto for yourself by visiting ReviveOurHearts.com. When you read the document online, you can add your name and support the important ideas it contains. We’re able to bring you a teaching series like this one thanks to listeners who support Revive Our Hearts financially. And Nancy, this is an especially important time for listeners to get involved. Nancy: It really is, Leslie. You know, transitions are really important. As we draw near to the end of something, it’s a time of focused energy and a final press toward the finish line. And when we begin something new, it’s a time for fresh thinking and looking at the opportunities ahead. Well, the month of May is a transition time for Revive Our Hearts. We’re at the end of one fiscal year. And as the finish line draws close on May 31, we’re pressing toward some financial goals for the year and asking the Lord to provide $680,000 in donations this month. We’re also getting ready for a new fiscal year that starts June 1. We are looking ahead to new opportunities. There are new book releases on the horizon, along with taking more steps to help women around the world hear this message in more languages. And the True Woman '18 conference is coming in September. As we launch a new budget cycle, we need your help to continue and develop the outreaches of Revive Our Hearts. So in this transition month, your gift is so important. It will help us finish strong and get ready for new avenues for ministry. We are in the final stretch to May 31. So if the Lord is prompting you to give a gift to help with this need, visit us at ReviveOurHearts.com, or give us a call at 1–800–569–5959. Thanks so much for helping Revive Our Hearts proclaim the Truth that sets us free. Leslie: Many people who claim to be pro-life are not as pro-life as they might think. Nancy describes why tomorrow. Please be back for Revive Our Hearts. Revive Our Hearts with Nancy DeMoss Wolgemuth wants to celebrate life! It’s an outreach of Life Action Ministries. 1James Weldon Johnson, “God’s Trombones: The Creation” drom The Heath Anthology of American Literature, Volume Two, Second Edition, pp. 1053-1055. Previous Program Will You Lay Down Your Rights? Next Program Are You Truly Pro-Life?